We illustrate the EC payment scheme with an example. In this case, we presume an engaged Singaporean couple (both Singaporeans) is looking to purchase a 3 bedroom executive condominium of $800,000 in Punggol. They have checked their eligibility to purchase and qualify to purchase an executive condo. Their combined gross monthly income is $9,000 and are first-timer applicants. 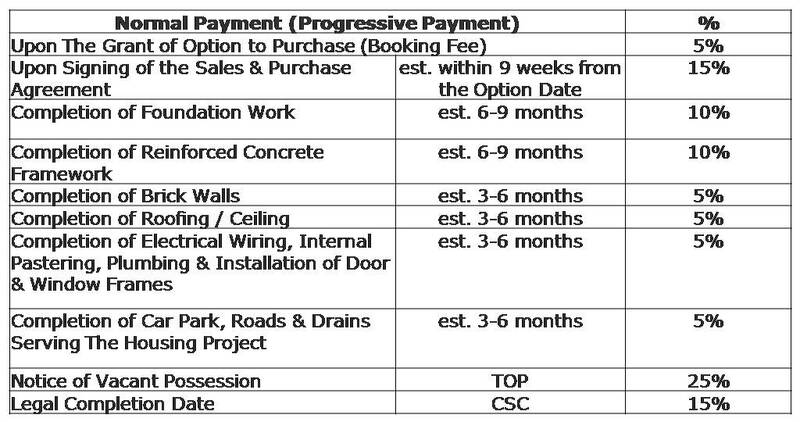 CPF payment: 15% of executive condominium purchase price (within 8 weeks of purchase) = $160,000. (Being two Singaporeans with income below $10,000, they qualify to receive $30,000 in CPF Housing Grant. The grant of $30,000 will be credited into their CPF accounts. They thus have to ensure that they have $130,000 in CPF in their Ordinary Account (OA) initially. For a Singapore Citizen + Singapore PR couple, the CPF Housing Grant eligible is $20,000. They can enjoy the full housing subsidy in future if their child is a Singapore Citizen. This is known as Citizen Top-Up which they have to apply. *Half-Housing Grant refers to one applicant is a first-timer applicant, while the spouse has previously taken a housing subsidy. #Can apply for Citizen Top-Up in future when the child is a Singapore Citizen. The NPS is recommended as home buyers on the DPS usually pay 2-3% more. You can view the schedule of payments under the Normal Payment Scheme (Progressive Payment) and Deferred Payment Scheme below. The maximum loan amount you can get from banks for your executive condominium loan is 80% of the purchase price. Please check with one of our recommended banks to get a more in-depth loan assessment for yourself. Can we pay first 5% using cpf? First 5% for new EC has to be in cash only. No CPF. Hi, Can I check why the loan amount for condo and EC are different? As the difference is quite drastic.. about 100% more for condo. That is because loan rules for EC follows the 30% Mortgage Servicing Ratio (MSR), while for condos it follow 60% Total Debt Servicing Ratio (TDSR), which explains why it can be a 100% difference. Can i assume all these grants will not matter to a single person buying a resale EC for the 1st time? Hi, I would like to have some info on what I should take note of when buying a house? Hi, Gabriel, it would be best if you engage the help of a property agent / real estate salesperson (RES) to help you with the decision making process. There are many things to consider, from your own suitability to getting an EC right down to choosing the best unit for yourself.